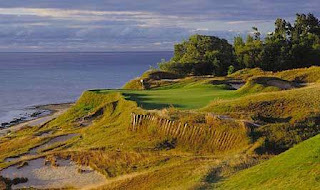 Whistling Straits (ranked #53 in the world) is located in Kohler, Wisconsin, about 90 minutes north of Milwaukee. Built by Pete Dye in 1998, it is a beautiful course. 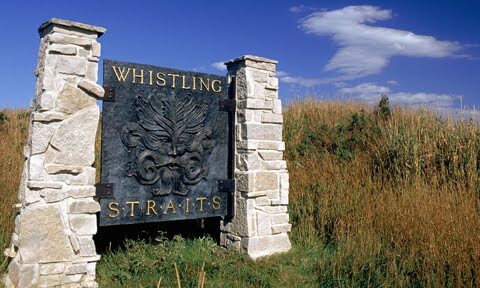 If you want to know what it is like to play golf in Ireland but don't want to fly across the Atlantic, Whistling Straits is as close as you'll ever get. The land the course was built on was formerly a U.S. Army base. Owner Herb Kohler instructed Dye that he wanted the course to resemble Ballybunion. The eight holes that play along Lake Michigan are the most dramatic. Similar to his work at Casa de Campo, Dye does a brilliant job of situating green sites along and above the water. The course is also over-run with bunkering. Many holes have scores of bunkers. Golf Digest estimates there are more than 950 bunkers on the course. That means on average there are 50 bunkers per hole. For basis of comparison, Winged Foot West and Merion East have less than 150 bunkers each on the entire course. Many of the bunkers don't actually come into play, but they give the course a dramatic and rough and tumble look. The dog-leg right eighth hole is especially noteworthy in this regard. It has a lot of small natural looking bunkers cascading down the hill between the fairway and Lake Michigan. Like at the Bandon Resort, at Whistling Straits you can only walk, there are no golf carts. This is to maintain the aesthetic in keeping with that of a links course. Cart parts would have ruined the look of the course. The course is full of wonderful little walking paths and natural looking matted down areas that you use to walk from hole to hole, just like in the British Isles. The par four fourth hole, "Glory"
The par threes along the water are all noteworthy, including the twelfth and seventeenth on the back. The twelfth hole plays only 138 yards and has a big green, but there is a little piece of it close to the water that is isolated from the rest of the green and it's the Sunday pin placement for tournaments. The effective landing area when the flag is set on this side of the green is tiny. The area the course is built in is isolated and pastoral. It is subject to foggy and changeable weather conditions since it is on the lake. The clubhouse is done in an understated and elegant manner. Sitting in the clubhouse on a misty, rainy day with a Guinness in hand is enough to trick the mind into believing you are in the Emerald Isle. I stayed at The American Club nearby, also owned by Herb Kohler, the owner of the resort. It is a very nice place and has a great pub. The dining room serves local fare including some great Wisconsin cheese. 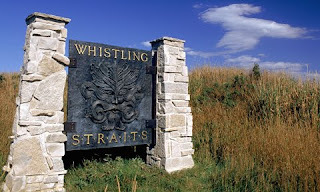 Since I live in Chicago, I've had the opportunity to play the Straits 8 or 9 times. If it were up to me, I'd have stopped playing it after the 3rd time, but out of town guests all want to play it, so I tend to play the gracious host. Yes, the site is spectacular, but the course conditions are rarely more than good. The course gets too much play and the greens tend to get pretty beat up. I've never met a top 100 course where the experience of play degrades with each additional round. I've played 20 or more top 100 courses more than once, several of them 4 or 5 times--in almost every instance, I've enjoyed these courses more the 4th time than the 3rd which was better than the 2nd etc etc. With the Straits, the 1st round was the by far the most interesting round for me. By the 3rd loop, I had enough of the Straits. 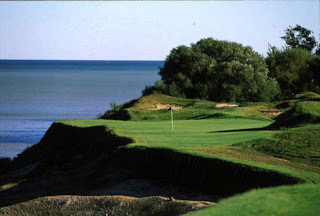 However, the River course, one of the three other Kohler courses is an absolute gem! I've played the River at least a dozen times and very much look forward to my next loop. They remodeled the course last year so that it resembles the original lay out, while at the same time lengthening a bit. It is a real treat. If you get to Wisconsin for an extended golf week, do your self a favor and play Erin Hills--it is a musy play for any serious golfer. Also, give Lawsonia Links a play as well. If you know a member at Milwaukee CC or Racine CC you be wise to trial those courses as well. Both are classic 100 year old courses which are classic designs that are becoming more rare each year. If you have not played the Straits, play your 5 1/2 hour round behind a husband-wife 4 some taking pictures on every hole, but there is no need to play it twice. The most overrated course I've ever played, and its not even close. The course conditions make you scratch your head and wish you were down the road at Blackwolf Run...or simply had bought another share of Apple. My two buddies and I meet each year to play golf for five days and catch up. Best week of the year for all three of us..
Two years ago we played the four courses at Whistling Straights.. We LOVED the River, and the Irish.. Black Wolf Run was a lot of fun as well, BUT we were the first tee time on a Sunday on the Straights course and it was magic.. In less than two weeks we are playing Pebble Beach, Spyglass, and Spanish Bay and the anticipation is KILLING me... The golf will be fun too!!! I'm surprised Tobacco Road is not on this list of courses to be played. This course is suppose to be Pine Valley South. Best part is its a public course. I've only played the Straits course once, and it ranks in my top 5 for best golf experiences hands down. I would rank it in my top 5 easily, along with Shinnecock, The Ocean Course, Piping Rock and Pinehurst #2. I rank it above Winged Foot and Balty. All that said, I had a great experience. Great weather, a 4:15 round, 2 great caddies. Layout is spectacular, and the Par 3s were excellent. I loved that it wasn't as much target golf as a traditional Pete Dye. That said, from a true architectural perspective I enjoyed Somerset Hills, Sleepy Hollow, Piping Rock, and The Creek much better.